Sick children break our hearts; It wasn’t too long ago that these kids were just like any other kids their age: with so much energy and so many plans and aspirations for the future. But all of a sudden, faced with a whole new routine of physically and mentally exhausting side effects, they are completely alienated from their previous lives. Parents, siblings and other family members are struggling to keep fighting for recovery on the one hand, while juggling the overwhelming bureaucratic, emotional and family-related difficulties surrounding the disease on the other hand. 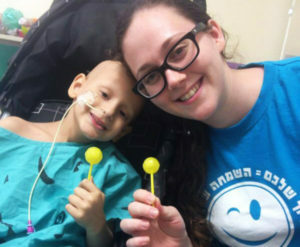 Or Menachem’s Vision is to help these children get through their treatments, while extensively supporting their families in the process. Because we believe a positive, stable family has a critically positive effect on the children, and their chances of getting better. We work non-stop, 365 days a year, to make our vision a reality – easing the hard times and creating as many moments of joy and happiness as possible. Their smile is our happiness, and we will do whatever it takes to get a smile on their faces. At Or Menachem we operate much like a start-up company; entrepreneurship to us is a way of life. We view entrepreneurship as a source of creativity and innovation, and accept new initiatives from doctors, volunteers, families, our board of directors and our partners – with open arms. We’re always open to changes, and constantly set new objectives all the way from organizational goals to team and personal goals.